Can Someone Refuse to Get Divorced in Illinois? Spouses often divorce because they cannot seem to get along, and sometimes that struggle carries over into the divorce process. In Illinois, one spouse can make the divorce process more difficult by disputing many steps along the way. However, though a spouse who opposes a divorce can make it take longer and cost more, he cannot actually prevent it from happening if the other spouse is determined to divorce. Illinois allows both no-fault and fault-based grounds for divorce. If you want a no-fault divorce, which requires little proof, and your spouse will not agree to the divorce, you must live separate and apart from your spouse for at least two years before you can get the divorce without his cooperation. In Illinois, you don’t necessarily have to live physically apart from your spouse to qualify for a no-fault divorce, so living together in the same residence after your marriage breaks down may qualify as living “separate and apart.” If your situation qualifies for one of Illinois’s fault-based grounds, you can file your divorce on that ground, but you must prove the ground is valid. Fault grounds include impotence, adultery, habitual drunkenness for two years and desertion for one year. If your spouse contests your chosen ground, he may delay the divorce process even more. To begin the divorce process, you must file a petition for dissolution of marriage in the county where you live. Your petition must give basic information about your marriage, including your proposed grounds for divorce, and address key issues like property division and custody. Once you file the petition, you must serve your spouse with the petition and other paperwork. If he does not want the divorce, he can answer your petition by contesting the grounds and terms. If you and your spouse cannot reach agreement on the terms of your divorce, you can voluntarily go to mediation or an Illinois court may order it. The goal of mediation is to help you reach agreement, but if you cannot come to agreement on all terms, your case will proceed to trial. 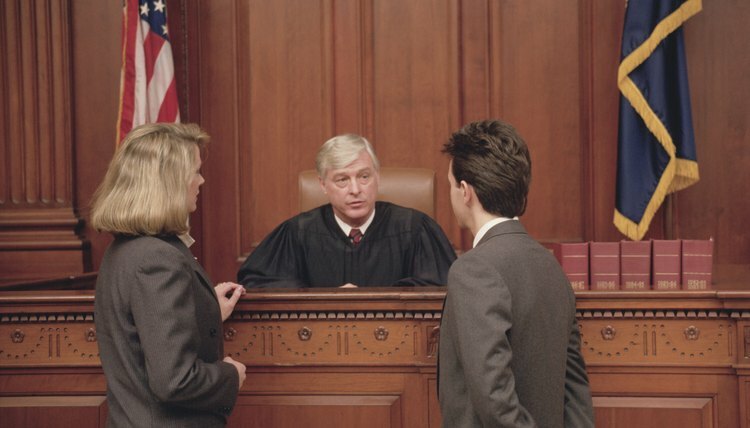 The judge will then determine the terms of your divorce, deciding any issues you could not agree upon. If your spouse simply chooses not to respond to your divorce petition because he doesn’t want the divorce, you can proceed with a default divorce as soon as 30 days after you served him. You must prove you served him with the paperwork so the court knows he had a chance to respond. Then, you may file a motion for default judgment, asking the Illinois court to grant your divorce — including all the terms you listed in your petition — even though your spouse has not responded. Illinois Legal Aid: Getting a Divorce in Illinois: What Are Some of the Reasons I Can Use to Get a Divorce? Can One Mate Refuse a Divorce in North Carolina? In North Carolina, a spouse who doesn’t want a divorce can make the process take longer and cost more, but he cannot prevent it from happening if the other spouse is determined to divorce. You cannot actually refuse to get a divorce since North Carolina does not require that both spouses agree on divorce in order for the court to grant it. Your spouse may file for divorce, believing the marriage is over, but even if you aren’t ready to divorce just yet, it’s really not possible to refuse to divorce your spouse in any state, including Georgia. You can slow down the divorce process, but eventually the divorce will go through, even if your spouse has to refile the case to make it happen.